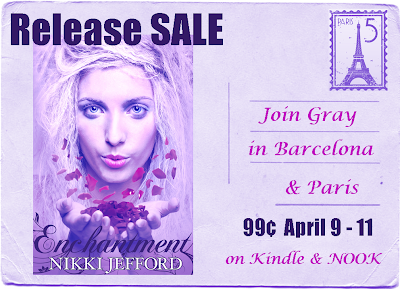 The lovely Nikki Jefford is releasing Enchantment, the third installment in her Spellbound series. Get it while it's hot! And click the banner for a giveaway and links to the rest of the series, the release party, and more! If the blurb below sounds great, check out the first two books in the series! Guilt ridden and brokenhearted, the duplicate Graylee Perez enrolls in a Spanish retreat for witches. Just as Gray starts settling into her summer abroad, her old adversary, Adrian Montez, brings his magic show to Barcelona. Gray seeks out a Spanish wizard for help banishing Adrian from her life once and for all. Instead, she ends up tumbling head first into a love spell with the arrogant warlock. After Gray follows Adrian to Paris, she must face her true feelings and decide if Adrian’s worth fighting for when he’s targeted for magical extraction.